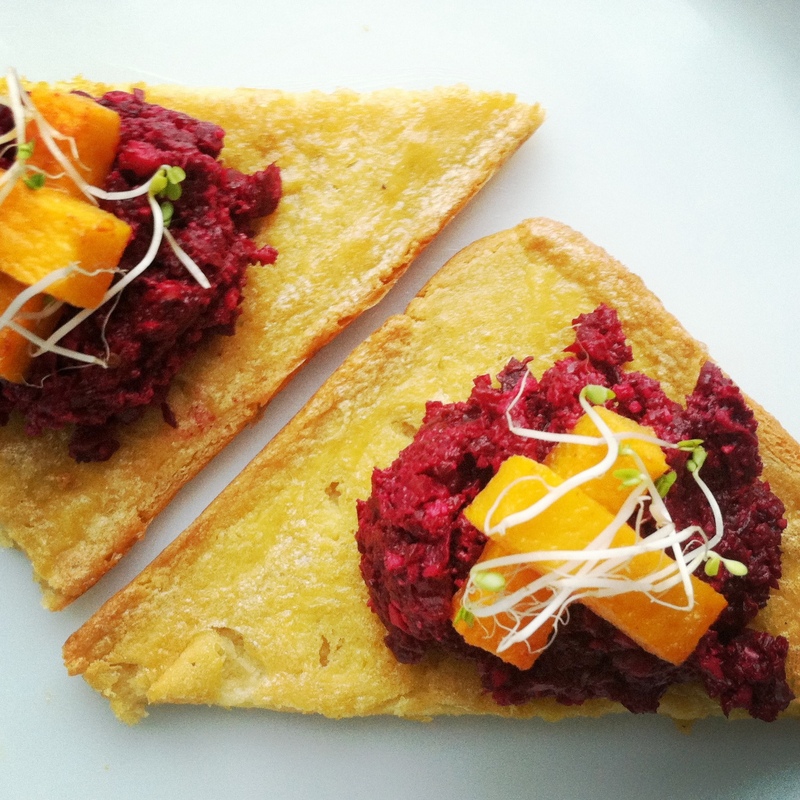 Chickpea Flatbread & Roasted Beet Dip. | Eat More Plants. Chickpea Flatbread & Roasted Beet Dip. One of my favorite ways to eat beets, regardless of the temperature outside, is roasting them. I love the way roasting brings out the rich, earthiness. Paired with roasted garlic and walnuts, this makes for a fabulously easy dip. I was eating it on its own honestly, until I realized that it would go perfectly with my blogger friend Shira’s chickpea flatbread. I’ve been meaning to make it for months and figured this would be a great opportunity. Her blog is not only inspiring, but informational as well. It’s a good read! Tons of great recipes, vegan and not vegan alike. In Pursuit of More. . Check it out! Whisk together flour and water in a large bowl, adding the water slowly at first to avoid clumping. Once you have added all the water and the batter is smooth, add in salt and pepper. Not more than a teaspoon of each is needed. When you’re ready to bake, heat your oven to 350. Skim off any foam on the top of your batter with a large spoon. Pour the olive oil into a large, rimmed baking sheet. Pour your batter in. It should be about 1/4 inch thick. CAREFULLY lift your baking sheet and place on the middle rack in your oven. I say carefully because one slip and you could have a floor full of batter and oil. Bake at 350 for 30 minutes, until golden. If your batter is thicker than 1/4 inch, you’ll have to increase the baking time. My pan was fairly thick and I did pour a little more than 1/4 inch, so I baked for about 42 minutes total. Let cool before cutting. Wrap each beet in aluminum foil. Roast at 350 for 45 minutes. Check for doneness by gently piercing each beet with a knife. If it pierces easily, it’s ready. If not, keep roasting! Set the beets aside to cool once cooked. Slice the top of your garlic head off without peeling any skin off, so that it sits flat on the bottom and the tops of each clove are exposed (as shown below). Rub the top of the garlic with olive oil and roast at 350 for about 15 minutes. You don’t want the garlic to dry out so check at 15 minutes and rub with more oil if needed. You can roast the garlic along side the beets but don’t forget about it! It will definitely burn if left in for more than 25 minutes. 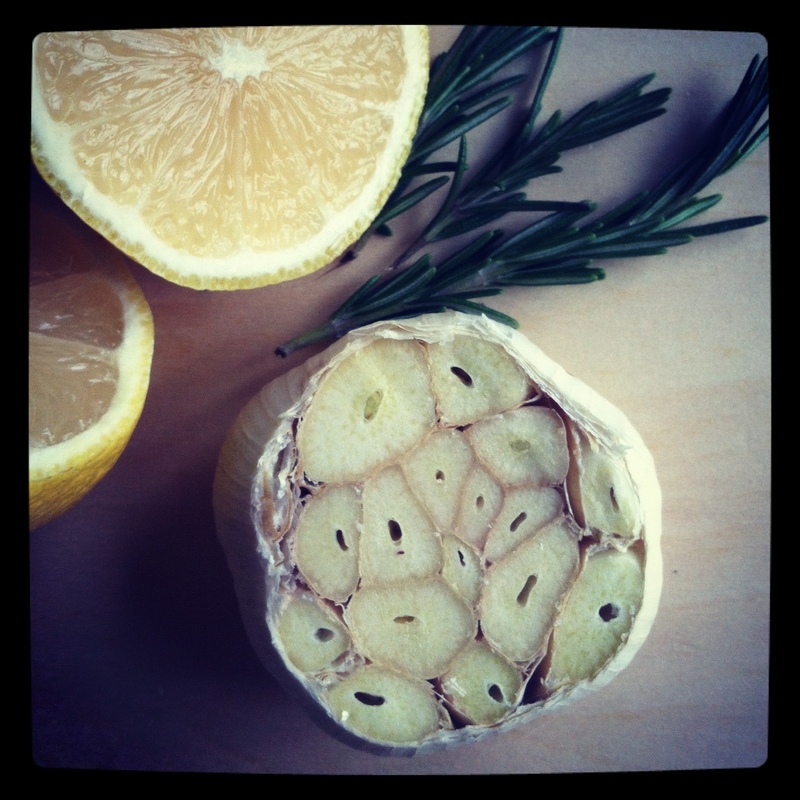 The garlic should be lightly browned, soft and easy to squeeze out of its skin once roasted to perfection. The smell is also a dead giveaway of how ready the garlic is. Place beets, 6 cloves of roasted garlic and the walnuts in a food processor. Blend until you have a fine crumbly texture. You can blend to your liking; I like mine to have chunkiness to it but you may want more of a paste. Season with salt and pepper. 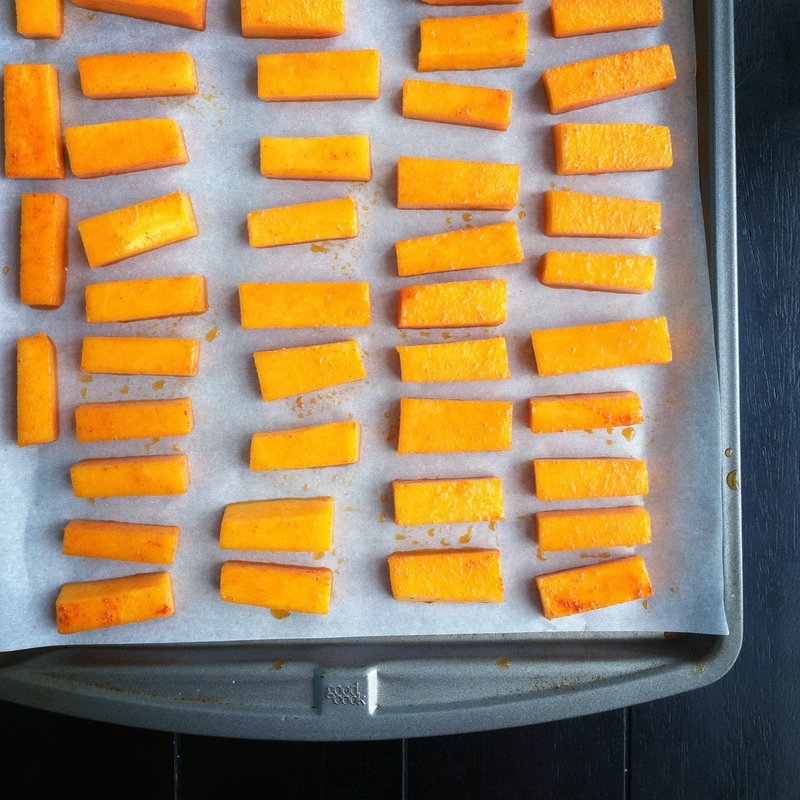 Since I had the oven on with an empty shelf, I also roasted some beautiful local butternut squash. Tossed it with smoked paprika, olive oil and salt. Mmm. Now that your flatbread and extras are ready, enjoy!! I love the texture of this bread. It’s addictive! And since I’ve cut out the gluten, it’s a great alternative for bread. Coconut & Chocolate Kale Chips…! My Better-than-Nutella Coconut Chocolate Cashew Cream. 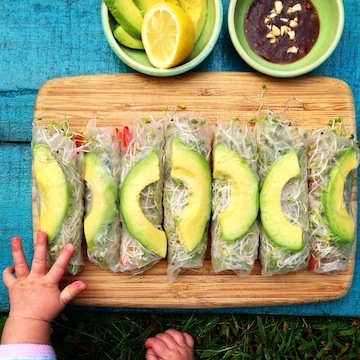 Summer Rolls & Miso Sauce. I believe in magic. I was just so desperate about new vegan recipes and then I found your blog. Love it! Thank you so much for the amazing work and colorful, inspiring pictures!